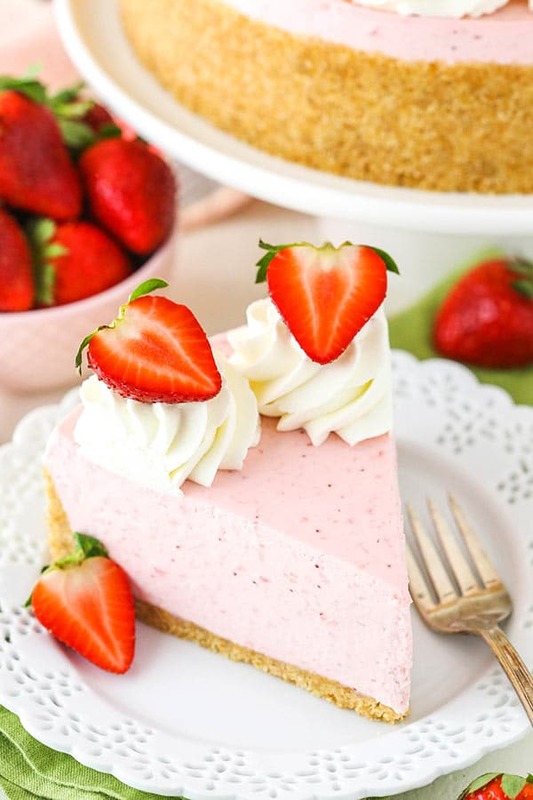 Strawberry desserts that depend on fresh strawberries for their flavor tend to present a bit of a problem. Pureeing enough berries to give you a good strawberry flavor ends up being a lot of liquid, which doesn’t always work well. 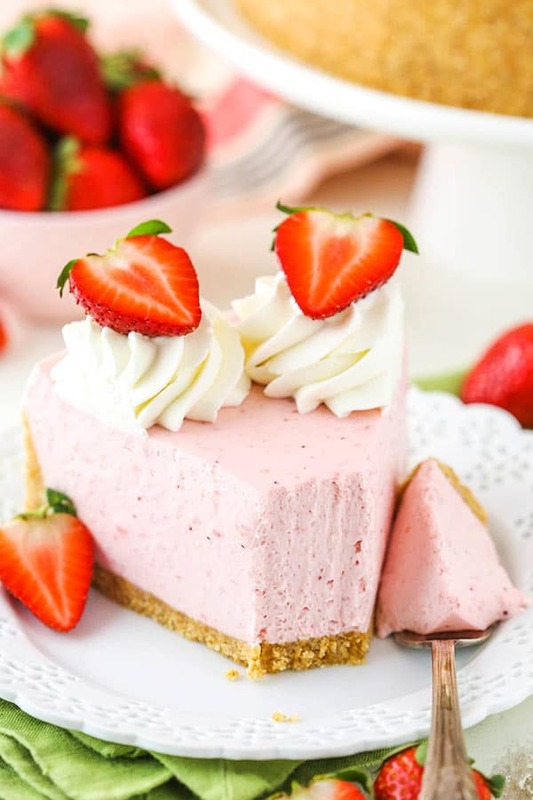 In a no bake cheesecake, it’s a problem because in order to not have your cheesecake melt all over the place, you need to thicken that strawberry puree. To accomplish that in this cheesecake, I used both gelatin and cornstarch, which is cooked with the strawberry puree over the stove. I tried using just one or the other, but wasn’t happy with either result. You need to add so much of either that it starts to really effect the flavor of the cheesecake. 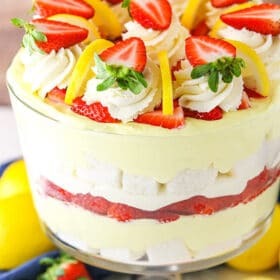 I don’t know about you, but tasting gelatin when I bite into a cheesecake is not what I want. So I used just the right combination of both gelatin and cornstarch to get a firmer texture cheesecake without interfering with the flavor. So to get started, combine the strawberry puree with some cornstarch and cook it over the stove. We are using a full pound of strawberries here. LOTS of flavor! Let the mixture come to a boil and then simmer for a couple minutes and it’ll start to thicken up nicely. Set it aside to being to cool a bit. While the strawberry mixture begins to cool, sprinkle a little water over some powdered gelatin and let it sit for about 5 minutes. It’ll get firm – just as you’d expect gelatin to do. Heat it up just until it’s melted and stir it into the cooked strawberry mixture. Let that cool a bit while you make the rest of the filling. The remainder of the filling is pretty straightforward. Combine the cream cheese and sugar, then make the whipped cream. The strawberry mixture is stirred into the cream cheese and sugar mixture in three parts. It might be tempting to just add it all, but you’ll end up with some lumps if you do that. I found that it turned out best when added more slowly, in three batches. 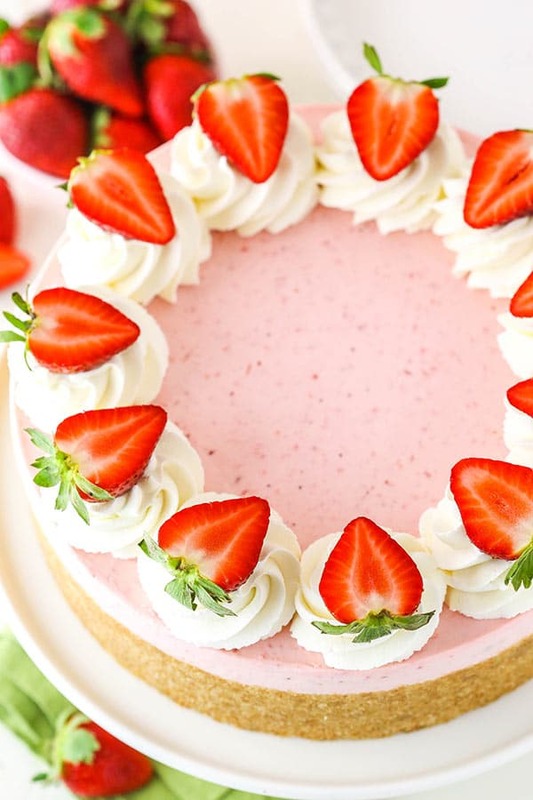 Once the strawberry mixture is added, fold in the whipped cream in two parts. The whipped cream lightens up the texture of the cheesecake and adds volume. The filling is added to a vanilla wafer crust, but you could also do a classic graham cracker crust if you prefer. Let the cheesecake firm up for several hours, until firm. One of the great things about cheesecakes is that they can be made ahead, which is what I typically do. You could definitely make this the day before serving, or even a couple days before. Cheesecakes last really well, which is awesome. The cheesecake is finished off with some whipped cream, which also stays sturdy and nice, and some strawberries. 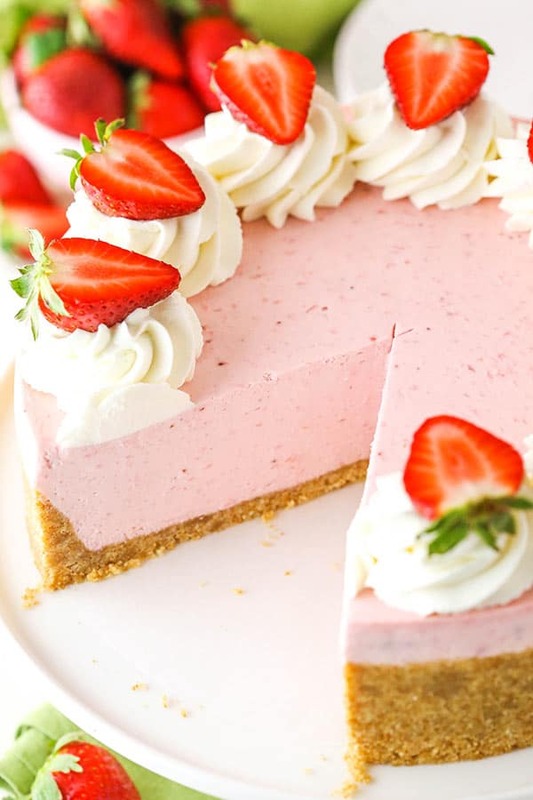 The final result is truly the perfect No Bake Strawberry Cheesecake! 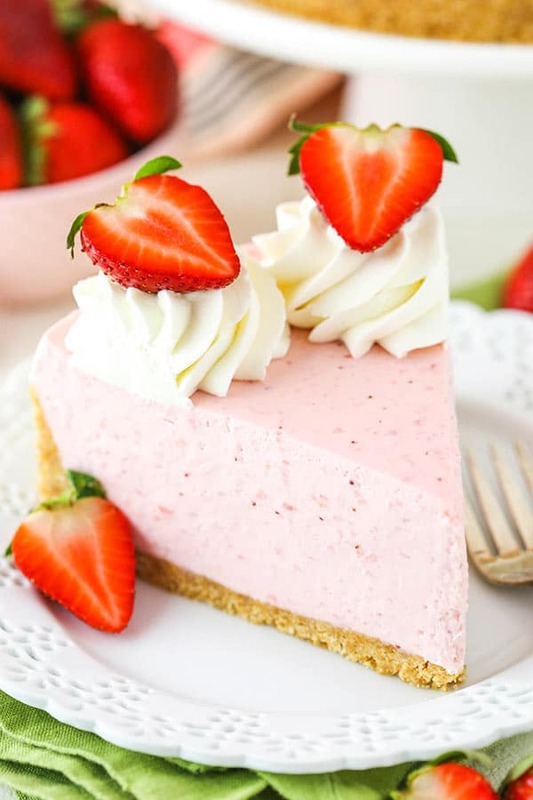 With a little gelatin and cornstarch, a full pound of strawberries is pureed and turned into a thick and creamy cheesecake! So much strawberry flavor and so delicious! It’ll definitely be your new favorite cheesecake for summer. 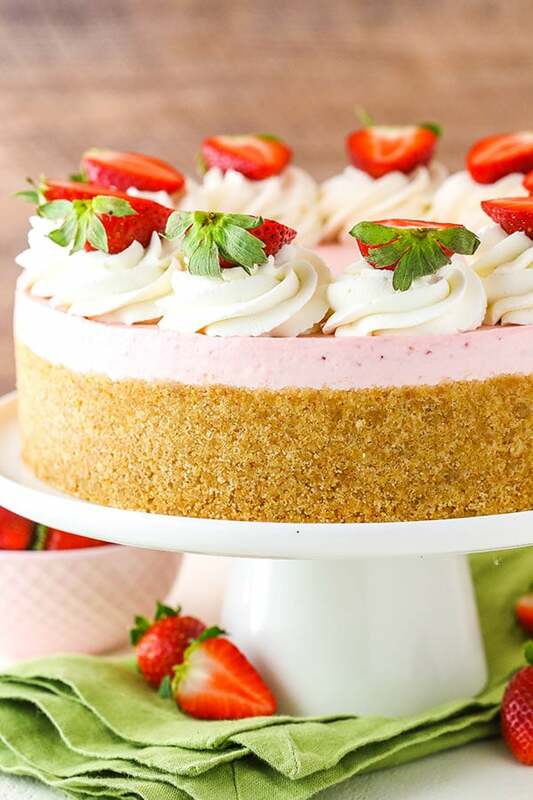 This No Bake Strawberry Cheesecake is full of flavor and uses both gelatin and a cooked strawberry mixture to make a thick and creamy cheesecake! Both the flavor and texture are on point and it’s the perfect cheesecake for spring and summer! 1. 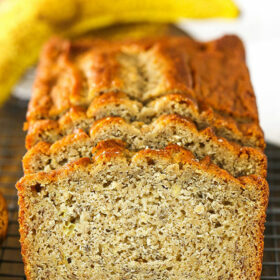 In a medium bowl, combine the crust ingredients and mix well to combine. 3. Add the strawberries to a food processor or blender and puree until smooth. 4. Add the strawberry puree and cornstarch to a medium to large saucepan and cook over medium heat, stirring constantly until mixture begins to thicken and bubble, about 5 to 10 minutes. 5. Turn the heat to medium-low and allow to the strawberry mixture bubble and simmer for 1-2 minutes, then remove from heat, pour into a bowl and set aside to cool on the counter. 6. Add the cold water to a small bowl and sprinkle the powdered gelatin over the water. Let it sit for about 5 minutes. 7. Heat the gelatin in 10 second increments, stirring between, until it’s melted and smooth. 8. Pour the melted gelatin into the warm strawberry mixture and stir well to combine. Set the mixture aside to cool a little while you work on the rest of the filling. 9. In a large mixer bowl, beat the cream cheese and sugar together until well combined and smooth. 10. In another large mixer bowl, add the heavy whipping cream, powdered sugar and vanilla extract. 11. Whip on high speed until stiff peaks form. Set aside. 12. Add about 1/3 of the strawberry mixture to the cream cheese mixture and beat until well combined and smooth. 13. Add another third of the strawberry mixture and beat until well combined and smooth. 14. Add the remaining strawberry mixture and beat until well combined and smooth. The strawberry mixture is added in parts to make sure it’s all incorporated fully without leaving any lumps. 15. Carefully fold the whipped cream into the cream cheese/strawberry mixture in two parts until well combined. 16. Add the filling to the crust and spread into an even layer. 17. Refrigerate cheesecake until firm, 5-6 hours or overnight. 18. To finish off the cheesecake, remove it from the springform pan and set on a plate or serving platter. 19. Add the heavy whipping cream, powdered sugar and vanilla extract for the whipped cream topping to a large mixer bowl. Whip on high speed until stiff peaks form. 20. Pipe swirls of whipped cream around the edge of the cheesecake. Top the cheesecake off with some sliced strawberries, if desired. 21. Refrigerate cheesecake until ready to serve. Cheesecake is best for 4-5 days. NOTE: If you’d like to use Cool Whip instead of homemade whipped cream, replace the heavy whipping cream, powdered sugar and vanilla extract with 8 oz of Cool Whip. This takes time but is delicious and the presentation is lovely .